Office Supplies Talk: Order Labels for Holiday Shipping and Receive a Gift Card! Order Labels for Holiday Shipping and Receive a Gift Card! As the holiday season kicks into gear, everybody will be sending packages. Shipping volume sees a sharp increase in these final months of the year, with FedEx and UPS hiring thousands of seasonal workers to try to keep up. If you're putting gifts or other items on the truck this year, you'll want to have labels you can print on clearly to make sure your package ends up going in the right direction. Avery, always the choice name for labels, wants to help by offering a gift card for your purchase. 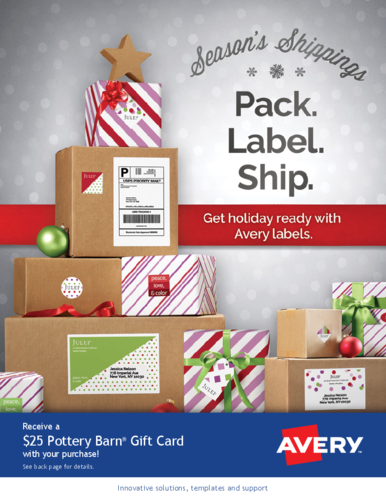 Order $75 or more of qualifying Avery products and you will qualify for a rebate netting you a $25 Pottery Barn gift card. That means that while you prepare to send presents to loved ones, you'll be able to claim something yourself! The rebates runs until the end of the year and there are more than just shipping labels eligible. 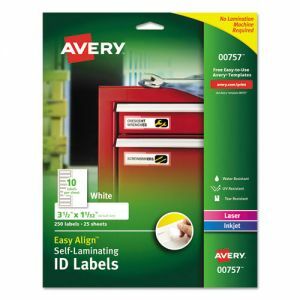 You can find neon labels, labels that print all the way to the edge, and Avery's newest creation- self-laminating labels. These print normally, but include a laminate film that applies easily and turns normal paper into a heavy-duty label. Once applied, it will resist weather, harsh conditions, and other wear and tear. Laminating ID labels are available in many sizes and compatible with any printer. go to our Web page you can play online games for free.